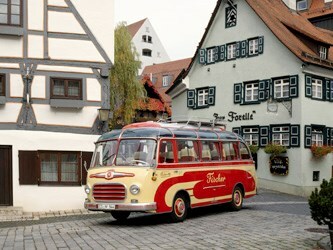 The Setra S 6 belonging to the Fischer Bus Company from Weilheim and der Teck, in the fishermen's quarter of Ulm in front of the Setra Museum (left) and the Forelle restaurant. A total of five examples of the S6, the compact coach with the world’s first self-supporting frame, will be on show in Hall 8 of the trade fair. 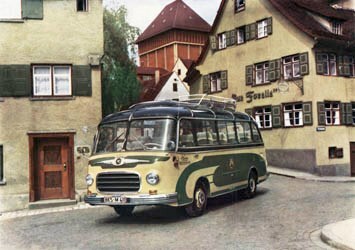 In 1955 the first Setra S 6 was presented in Geneva. Fifty years after production stopped, Setra will be shining the spotlight on a coach model which featured largely in the success story of the long-standing Daimler brand from Ulm, Germany, the Setra S 6, at the Retro Classics stand at the Stuttgart Trade Fair on March 7-10. A total of five examples of the S6, the compact coach with the world's first self-supporting frame, will be on show in Hall 8 of the trade fair. In addition to buses belonging to the firms Rast-Reisen, Schranner, Kronberger and Fischer, Daimler's Ulm-based bus brand will also be exhibiting an S6 from the Setra classic collection in Neu-Ulm. 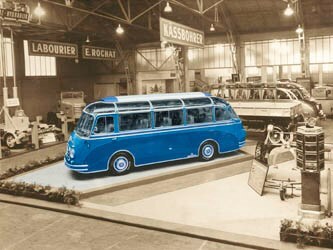 The third-ever coach from Setra premiered at the Geneva Motor Show in1955. The 6.7-metre long and 2.25-metre wide coach became the basis for all compact buses of the brand to follow. A total of 1,172 examples of this model, which can still be admired at many classic vehicle events, were manufactured up until 1963. The technically outstanding features include four independent wheel mountings with double wishbones, which is unique to this day, rubber springs with telescopic shock absorbers and a steering column gear shift. A low centre of gravity and the ideal ratio between wheelbase, overhang and track width ensured stable road-holding at all times. The S6 was powered by a 517 D 4K Henschel four-cylinder diesel engine, the output of which was boosted in later years from the original 85hp to 100hp with the aid of a belt-driven compressor. Retro Classics has become truly established as an international exhibition for classic vehicles, spare parts and restoration. Last year, 65,000 visitors flocked to the halls of the Stuttgart Trade Fair. This year it will be held on Thursday, March 7 from 3pm to 7pm, on Friday, March 8 from 10am to 7pm and on Saturday, March 9 and Sunday, March 10 from 9am to 6pm.